Hans von Marées came from a noble family. When he was sixteen he entered the Academy in Berlin, where Carl Steffeck was his teacher. After only a year he left and after his military service he settled in Munich 1857. There be befriended Franz von Lenbach and Anton Teichlein. He mainly painted portraits and landscapes and was in financial difficulties until Graf von Schack asked him to go to Rome to copy important paintings for him. In 1868 he broke with Von Schack and from then on he was supported by Konrad Fiedler, with whom he travelled in Spain, France and the Netherlands in 1869. He joined the army during the Franco-Prussian war of 1870/1871. After that war he settled in Berlin, where he worked side by side with his close friend Adolf von Hildebrandt. In 1873 he returned to Italy to create frescoes for the new Zoological Institute in Naples. He befriended Arnold Böcklin and settled in Florence in 1874. In 1876 he broke with Hildebrandt. The last part of his life he lived a lonely life in Rome, mostly shunning the company of other people. He died in 1887, aged only 49. An important selection of his work can now be seen at the Neue Pinakothek in Munich. 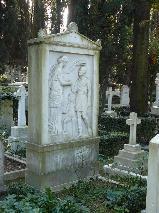 The grave of Hans von Marées at the Cimitero Acattolico, Rome.